UAS operators are eager to access open airspace, which of course is the marketplace for the future deployment of their particular systems. However, regulation today demands that UAS flights beyond visual line of sight, (BVLOS) must be conducted in segregated airspace. From West Wales Airport, UAS operators immediately access the largest area of segregated airspace for UAS operations anywhere in Europe, so have the best possible opportunity to train personnel as well as demonstrate capability and reliability. 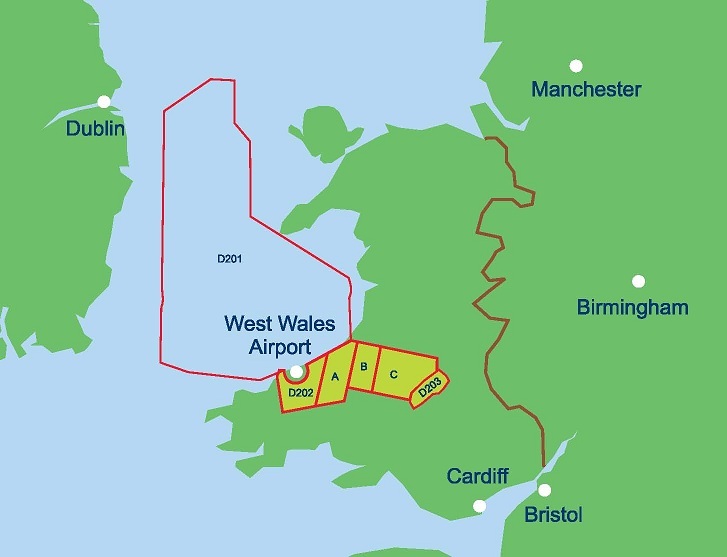 To the West of the airport UAS flights directly access 2,000 square miles of segregated airspace over the sea. This area has an unlimited ceiling height for operations, so is ideally suited for unmanned systems that require to undertake endurance flights, carry out operator training or work at extreme altitudes. 2500 sq miles UAS airspace over land and sea. To the East of the airport flights access 500 square miles of segregated airspace over land. This area is sectored into areas of various base heights and ceilings. Activated by NOTAM, it enables UAS flights to operate from surface level in the vicinity of the airport and if cleared to do so, further access to the military training area in Danger Area D203.